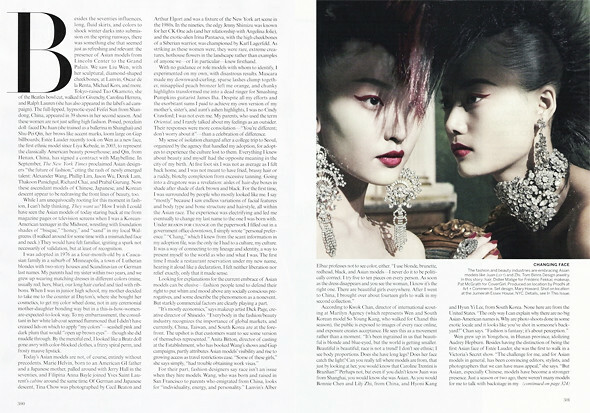 In the month of December, Vogue US dedicted a 4-page editorial to Asian top models. 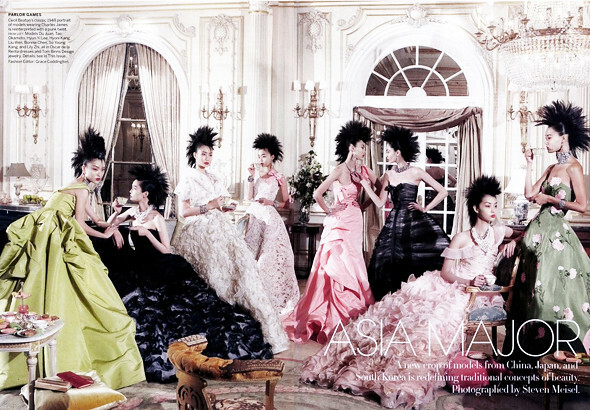 Du Juan (杜鵑), Tao Okamoto, Lee Hyun Yi (이현이), Hyoni Kang (강승현), Liu Wen (刘雯), Bonnie Chen, Kang So Young (강소영) and Lily Zhi were shot by Steven Meisel and styled by Grace Coddington. It was an absolutely delight to see the 4-page editorial despite being incredibly disappointed. Wished it wasn't just a 4-page editorial with 2 pictures. But I'm glad the industry is opening up to more Asian models and most definitely, incredibly excited for the Korean models! Huge step for Kang So Young (강소영) who recently debuted, and great exposure for Lee Hyun Yi (이현이) and Hyoni Kang (강승현) who was recently booked for DKNY's Resort 2011 ad campaign. Read editorial here, (A) (B) (C). inredibly disappointing - especially because the styling looks wonderful. i feel like they should have done close ups similar to the second shot, of all the girls. but even this is great!